In one shake, you get concentrated fruit extracts with 42 purifiers, energizers, detoxifiers and cleansers are packed into this powerful fruity meal replacement. Already making a shake or beverage? Consider adding All Day Energy Greens Combo with Go Ruby Go to your shake for even better results! The comprehensive blend of high quality ingredients essential vitamins, fruits and berries. Dissolves well when added to liquids that lessens the gritty texture with similar products. Includes 6 probiotic strains to help improve and maintain the GI track. Contains 80mg Vitamin C, 133% of your daily required value. 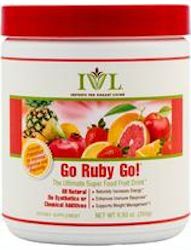 Contains a variety of 42 fruits and nutrients compared to other fruit powders that only contain one or two ingredients. Backed up by medical doctor, Bernard M, MD. No sugar added. It is naturally sweetened with the fruits and contains 3 grams of sugar per serving. Not available in convenient individual packets. Go Ruby Go is not gluten-free. Super Wheatgrass Combo is gluten-free. Currently no soy free fruit product is available from IVL. Not available in larger size canisters; however does come with discounts for 3 and 6 containers ordered at once.